The Kahana Sunset is a beach front resort located on the world famous West Coast of Maui between Kaanapali and Kapalua. Kahana Sunset fronts Maui's most romantic white sandy beach nestled on protected Keone Nui Bay with spectacular views of the islands of Molokai and Lanai. We offer spacious one and two bedroom condominiums, each with its own private Lanai. The condominiums feature a fully equipped kitchen (complete with oven, dishwasher, washer dryer and more), cable TV and telephone(s) with data jacks. All the units have ceiling fans, but are not air conditioned (some are). On-site: beautiful secluded white sand beach on Keone Nui Bay, sixty foot Lima shaped heated swimming pool, snorkeling for tropical fish just offshore, surfing/windsurfing in front of the resort and nearby Kahana Beach Park. The townhouse has recently been remodeled; but because it is not fully remodeled, (the furniture is older plantation style and the kitchen is not remodeled), it is offered at $100 + taxes per night less than those that are fully remodeled and similarly located. The two full bathrooms upstairs and the half bathroom on the ground floor are all remodeled. The king bed and pillows in the Master bedroom are new as are the two twins in the second room. The downstairs area and upstairs Master bedroom were just painted and new ceiling fans and light fixtures installed. The carpet is only a couple of years old, clean and looks fresh. New large flat screen TVs are in the living room and Master bedroom. Our home is two stories high. On the lower level you have a half bathroom as you enter, then a full kitchen with an expansive view of the ocean, followed by a dining and living room with direct unobstructed views of the ocean and the islands of Molokai and Lanai. The upstairs has two bedrooms each with it's own full bathroom. The Master-bedroom faces directly out towards the ocean. It has a new King size bed, flat screen TV, and a very large lanai with two lounge chairs and a table. You do not have to close the curtains at night for privacy; your neighbor is the ocean. Keep the glass sliding door open and allow its sound to lull you to sleep. The second bedroom has two new twin beds that can be moved together and a TV. Our home is very private, there is no need to walk in front of other units to access the beach; and, unlike units that are on the beach, your privacy will not be disrupted by guests coming and going to the beach. Incredible townhouse condominium with the perfect oceanfront location right next to one of Maui’s most beautiful and safest reef-protected beaches. This beautiful townhouse condominium has just undergone a complete designer remodel. The remodel features limestone floors and bathroom tile as well as granite countertops in the kitchen and all bathrooms. There are all new state of the art appliances in the kitchen as well as custom framed art and Tommy Bahama and designer selected furniture throughout. Large screen 52-inch HD TV's with blu-ray DVD players and surround sound can be found in the living room and master bedroom along with a 42-inch HD television in the second bedroom. The bedrooms and baths are uniquely equipped with high quality linens and towels. This unit has air-conditioning. This beautiful Kahana Sunset townhouse condominium with terrific views sets 50 feet from the ocean, nestled on secluded and reef-protected Keoninui Bay next to Maui's most romantic white sandy beach. Listen to the ocean and watch amazing sunsets directly from lanais off both the living room and master bedroom. Swim with the sea turtles in the cove directly outside and below the unit. This 2 bedroom 2 ½ bath unit features, a full kitchen complete with dishwasher, washer/dryer, sleeper sofa, cable television and wireless internet. There is a king size bed in the master bedroom and two full beds in the second bedroom as well as a sleeper sofa in the living room. ​This beautiful 2 Bedroom, 2.5 Bathroom with AC is new to our rental program! 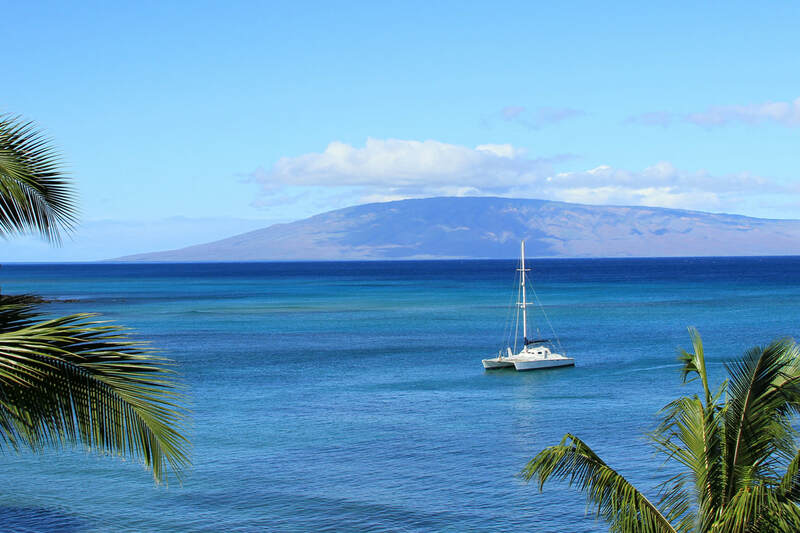 It is an oceanfront remodeled condo with spectacular views of the island of Molokai. This unit will feel like your Maui home with Hawaiiana furnishings along with upgraded cabinets and countertops throughout. The bedding consists of a King bed in the master, a queen and twin bed in the second bedroom and a sofa sleeper! The views and easy access from both the upstairs and downstairs lanai's will make for that perfect relaxing vacation you were hoping for! There is also an awning for the downstairs lanai. This two bedroom, two and a half bathroom is strategically located in the middle of the ocean front A wing of the resort, overlooking Keone Nui Bay and it's family of resident turtles and tropical fish, and is just steps to the beautiful sandy beach. The main floor features a gourmet, fully remodeled kitchen with granite countertops, state of the art appliances, utensils and a washer and dryer. The living room is tastefully appointed with just enough island effect, and includes a Flat Screen HDTV, iPod dock and Blue Ray DVD. The open concept floor plan brings the breathtaking view inside. An electric retractable awning provides shade over the lanai, providing an 'outdoor room' comfortable throughout the day! Air Conditioning is installed throughout, with separate air controllers for each bedroom and the main floor. The master bedroom features new, tropical dark wood furniture, lovely marble vanity and bathroom, a flat screen HDTV and a spacious balcony/deck with unobstructed views of Molokai and Lanai. The surf will lull you to sleep if the memory foam mattress doesn't! The second bedroom is very large and features new, tropical furniture, including a queen bed, a twin bed, spacious full bathroom, and a flat screen HDTV. Whether you dine out or cook at home, you have many options. This remodeled two bed ocean front townhouse condo sleeps up to five people with a king bed in the master bedroom, twin and queen beds in the second bedroom. There are two ocean facing lanais with this condo. One lanai is off the living room and another lanai is off the master bedroom. This condo is equipped with a full kitchen and washer/dryer. No air conditioning. Condo has ceiling fans, louvered windows, sliding doors and usually cooling trade winds. Kahana Sunset sits on Keone nui Bay with beautiful views of the islands of Molokai and Lanai from the year round beach area. The Bay is very swimmable with lots of turtles in the water. The Kahana Sunset has free high speed internet wifi access. T​he resort fronts Maui's most exquisite white sand beach nestled on protected Keone Nui Bay with spectacular views of the sister islands of Molokai and Lanai. Our spacious (1100 square feet) ocean view home contains two bedrooms and two bathrooms on the upper level with a fully appointed kitchen (granite countertops & modern appliances), dining and living rooms on the lower level. Additionally, there are two large, private lanais which further your outdoor experience and provide knock-out sunset views. The Kahana Sunset is an intimate vacation experience where families can relax and recharge. Our unit is so close to the ocean and the pool, everyone can partake in the activity of their choice and still feel close together. No wonder families who visit the Kahana Sunset come back year after year. It's the spirit of ALOHA!! ​Our condo has been completely remodeled to include new appliances and every amenity you could ask for. Our kitchen includes a spacious 12 foot granite counter top with seating and views of the pool from outside our family room complete with a flat screen TV and DVD. We have also installed an additional stone patio outside the master bedroom that provides more outside living space to relax and enjoy the beautiful tropical gardens of the property and breathe in the ocean breeze. Evenings are great for grilling on the many BBQ's on property where you will meet guests from all around the globe sharing their days activities and stories to last a lifetime. This 1100 square foot home was totally remodeled in January 2009. It is beautifully furnished in a tasteful and tropical décor. Features a spacious downstairs living, dining, kitchen area, and powder room. The upper level has two bedrooms each with a full shower. It sleeps seven with a king in master, and queen/twin combo in the back bedroom. You'll find flat screen HD TVs in every room with a Bose in-wall speaker system and dock for your iPod in the living room entertainment center. The kitchen, with its spacious granite peninsula, is well-appointed. GE Profile appliances (side-by-side fridge, icemaker, electric cooktop/oven, dishwasher and microwave). Cuisinart knives, champagne/wine glasses - completely outfitted for cooks! There is an herb garden just below the lanai. Help yourself! The lower lanai is one of the few that has an external retractable sunshade awning providing welcome shade or shelter from the rain. Covered and uncovered parking are just 15 feet from the front door - no stairs. Located close to the ocean, pool and bar-b-q facilities, B-3 is a recently remodeled 2 bedroom-2 1/2 bath unit. Well-equipped spacious kitchen with granite counters. Dining table seating 6. Hide-a-bed queen sofa in living room. Electric retractable awning over lower lanai adds an extra outdoor room. Half bath located downstairs. Upstairs master bedroom with roomy shower. Guest room with one queen and one twin bed. Well-lit double-sink and shower. Washer/dryer. Well-stocked closet with snorkel equipment, sand toys, etc. ​Beautiful ocean view one bed one bath condo located at Kahana Sunset Resort on Keonenui Bay just south of Napili and Kapalua. Great ocean views of the islands of Molokai and Lanai from the beach area. Short walk from this unit to the ocean, pool and white sand beach that fronts the property.Hawaiiana furnishings with King bed and queen sofa sleeper. Kahana Sunset offers an outdoor pool and a bar/lounge. If you want low-key dining options, you will be pleased to find barbecue grills and a picnic area. Newly (2016) remodeled kitchen and updated main floor furnishings. Newly installed air conditioning throughout as well as a ½ bathroom. This two bed ocean view townhouse condo sleeps up to six people with a king bed in the master bedroom (2nd floor), two twin beds (2nd Floor) in the second bedroom and a Queen sized wall bed (Murphy bed) in the livingroom (main floor). There are two ocean facing lanais with this condo. One lanai is off the living room and another lanai is off the master bedroom. This condo is equipped with a full kitchen and washer/dry Condo has ceiling fans, louvered windows, sliding doors and usually cooling trade winds.The Kahana Sunset has free high speed internet wifi access. This newly remodeled unit has two flat screen TV's,VHS,DVD player,CD player, granite counter tops throughout, tile floors, breakfast bar, stainless steel appliances, new kitchen cabinets, free internet access, great ocean views. The property has a pool and gas BBQ's, sandy beach and beautiful sunsets and sometimes turtles in the bay. the bedding is King,queen,twin and queen sofa sleeper in living room. Enjoy a relaxing vacation at a friendly and beautiful small resort by the ocean, to which satisfied guests return year-after-year. The apartment has 2 fully separated bedrooms, each with its own bathroom, and an additional sofa bed sleeping 2 in the living room. There are 2 lanais, both with ocean and garden views. Flowering garden paths pass by a heated swimming pool and descend to a spacious sandy beach, good for swimming, facing panoramic views over a vast expanse of ocean and the neighbor islands of Lanai and Molokai. A special experience is to enjoy the brilliant sunsets while BBQ-ing and dining or partying at the waterside terrace. The apartment is fully equipped, with tile floors throughout, free Wi-Fi and ample parking with space directly in the back of the unit. Ocean view C Building. Two Bed Two Bath. A/C throughout condo, Awning on lower lanai … Flat screen TV's throughout condo. Two sofas in living room. Tiled flooring downstairs, carpets on stairs and bedrooms. Bath tub in master bathroom. Very nice views of the pool, grounds, ocean and islands of Lanai and Molokai. Short walk to pool, Gazebo BBQ areas, Keonenui Room, beach and ocean … Very nice condominium for the price! This is an original Kahana Sunset unit with an oceanview. It has a TV, dvd, vhs player & CD player, along with free internet access, and a wine cabinet. This unit is just a few steps to the pool and a short walk to the beach!Kahana Sunset sits on Keonenui Bay with beautiful views of the islands of Molokai and Lanai from the year round beach area. The Bay is very swimmable with lots of turtles in the water. There is a 60’ heated swimming pool on property as well as several gas BBQ areas. This is a great unit at Kahana Sunset! It has a gorgeous ocean view from both the upstairs & downstairs lanai's. It is a 2B, 2B and the bedding is a King and 2 twins. You can watch Maui's most amazing sunsets right on this Lanai!Kahana Sunset sits on Keonenui Bay with beautiful views of the islands of Molokai and Lanai from the year round beach area. The Bay is very swimmable with lots of turtles in the water. The Kahana Sunset has free high speed internet wifi access. There is a 60’ heated swimming pool on property as well as several gas BBQ areas. Perfect for families and couples. This two-bedroom, two-bath townhouse style unit has gorgeous direct ocean views from our two lanais and from inside our living room and master bedroom. The remodeled kitchen has granite countertops, wood cabinets, full sized fridge, full sized dishwasher, glass electric cooktop, microwave, and countertop convection oven. It comes fully stocked for cooking and entertaining. There is a washer/dryer in the unit with its own hot water heater. Each bedroom has its own private bathroom, making our layout perfect for families or two couples traveling together. Our in-unit safe can hold a large laptop. There are two TVs, a stereo, and a large video collection for your enjoyment. Covered parking is conveniently located right outside our door. D5 offers our guests a relaxing place to vacation while enjoying the comforts of home in a lush, tranquil, beachfront setting. Newly Remodeled as of December 2015. One of the best views on the property overlooking the pool toward the islands of Molokai and Lanai from both upper and lower lanais. A 2 Bedroom/2.5 Bathroom unit with a fully equipped kitchen including a washer/dryer. Free WiFi and cabled Internet. Each bedroom has their own private bath and flat screen. The living room has a flat screen TV with DVD/VCR. ​This is a beautifully remodeled two bedroom, two bathroom with an ocean view. This unit is equipped with three flat screen cable TV's, washer/dryer, ceiling fans in all rooms including the bathrooms, two private Lanais, granite counter-tops, tile floors throughout and new appliances. It has free wireless internet access and DVD players on two of the TV's. gorgeous sunsets from the lanai's. Beautiful two bedroom two 1/2 bath two level condo located at Kahana Sunset Resort on the white sandy beach Keonenui Bay. South of Naplili and Kapalua. Great views of the beach, bay and lush gardens. Heated pool, bbq area and secluded white sand beach fronts the property. Great ocean views of Molokai and Lanai islands. This condo is fully furnished and equipped. king, queen, twin and queen sofa sleeper. What is special about this unit is that it is quiet. It is tucked away from the swimming pool, and the beach noise. Guests enjoy tropical flowers, large mango and banana trees. Unit has 2 lanais. Lower floor lanai offers garden like setting with dining table close to the kitchen. Upper floor lanai offers beautiful ocean view and sunset, and has 2 lounge chairs. Otherwise it's remodeled unit, 2bdr/2ba, fully equipped, 2 floors, sleeps 6.... Flat screen TV's, wi-fi, comfortable stand up showers,King, 2 twins and a Queen sofa sleeper. ​Unit D11 is a two bedroom end unit with only one adjoining condo and no one underneath. There is covered parking right outside the door which means easy delivery of luggage and groceries. The unit itself has been completely remodeled with granite countertops throughout.The downstairs livingroom has tiled floors, a large flatscreen television and its own lanai with a retractable awning. The master bedroom has a king sized bed,tv/vcr and its own lanai, air conditioner and bathroom with shower and toilet. The second bedroom has one queen bed and one single.It also has its own bathroom with a tub/shower combination which is ideal for children and its own tv/vcr. There is also a queensized hide a bed in the living room for extra sleeping. The condo is well ventilated and situated to take advantage of the trade winds and is just a short distance from the beach and pool. Your Maui vacation is complete with a spacious two bedroom two bath unit in Kahana Sunset right on a beautiful secluded sandy beach. Visitors return to this comfortable vacation home which sleeps six with plenty of room for your own family and guests as well. Prepare meals in the fully equipped kitchen or barbeque on one of several gas grills by the pool. Enjoy ocean views from either of two spacious lanais fronting the living room and master bedroom. Lush tropical grounds and a friendly casual atmosphere enhance vacation living in this low rise complex. Everything that you could want to make it your home on Maui is provided; all you need to bring is your clothing and food. Snorkeling and swimming with Sea turtles in the bay and whale watching from the shore as well as fine dining nearby make it a very special place. Kahana Sunset Unit F-1 is an ocean front 2-bedroom, 2 1/2 bath unit situated on the ground floor. The ocean views from the master bedroom, kitchen, and living room is outstanding. The unit has been recently remodeled, with a modern kitchen, tile floors throughout, large high definition flat TV, washer and dryer, free internet, telephones throughout and beautiful views. The lanai is off the living room with furniture and fabulous views of the bay and ocean. Covered parking is located behind the unit. Sunsets and rainbows over the ocean, beachfront 2 bedroom, 2 1/2 bath condo, hear the waves with your bed just 30 feet from the waters, sleeps six with king, queen, twin & sofa sleeper on two levels. Master suite has private cabana with panoramic ocean views and views of the island of Molokai. Fully equipped & updated kitchen & communal grill. Dine alfresco, just above the beach. Washer/dryer, TV/DVD and high speed WiFi. Snorkel shop and fresh seafood minutes away. This beautiful unit is air conditioned. There is also a heated swimming pool on property for everyone’s use. This is a beautiful remodeled townhouse two bedroom, two and half bathroom beach front view unit. It has tile flooring throughout, granite counter tops in both the kitchen and bathrooms. New kitchen cabinets and appliances, washer/dryer, TV, two lanai's: upstairs and downstairs. Bedding includes: King/Queen/Twin. great swimmable beach. Incredible ocean views and beautiful views of the Island of Molokai. This unit will not disappoint. This unit is an ocean front condo just right off the white sand beach and the Keonenui Bay that front Kahana Sunset.Two bedrooms two and half bathrooms. No sofa sleeper. The kitchen and master bath have been recently remodeled. There is tile flooring throughout the downstairs, new cabinets, granite kitchen countertops, all new appliance and beautiful hawaiiana decor. There is a washer/dryer in the condo, flat screen TV in the living room, and free high speed internet wifi access. You will hear the ocean from inside the condo. There is an upper level lanai off the master bedroom and a lower level lanai off the living room area. Incredible ocean views and beautiful views of the Island of Molokai.